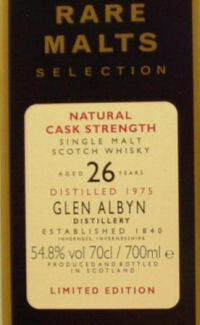 Glen Albyn Scotch Whisky Distillery was built in 1846, but is now closed. It was situated in Highland region of Scotland in the Inverness area. The disitllery site in now a shopping complex. The Glen Albyn Distillery was built in 1847, but fire destroyed the building only 2 years later and has had a rocky history during the 19th century. In 1855 the distillery fell silent and was on the market to be sold. Know buyer was found and the distillery closed it door and became a flour mill in 1866. Nearly 20 years later the distillery was re-founded and built with its own private railway line next to the distillery building. Again this distillery was used by the Navy during the First World War so was again silent during this period. The distillery had a few owners during the 20th century and in the 1970 released a number of bottles. But it was not until the start of the new century that a new series was released – Rare malt series. This included a number of independent bottlings and over the last 10 years the rating has gone through the roof with all the malts from this distillery.